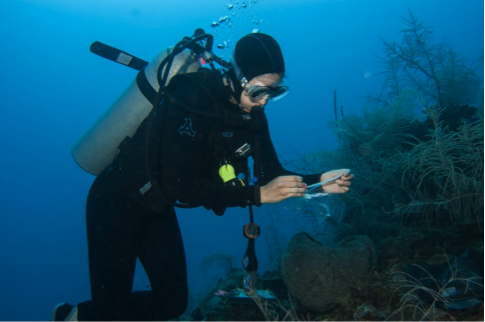 Aquarium coral biologist Randi Rotjan, PhD, is in Belize studying changes in the reefs off Carrie Bow Cay along with diver Sarah Taylor and aquarist Pete Gawne, both also from the Aquarium. Over the next couple weeks, she'll be posting from the tropics, sharing pictures and stories from this familiar spot. Learn about previous expeditions in 2013, 2012, 2011 and 2010. 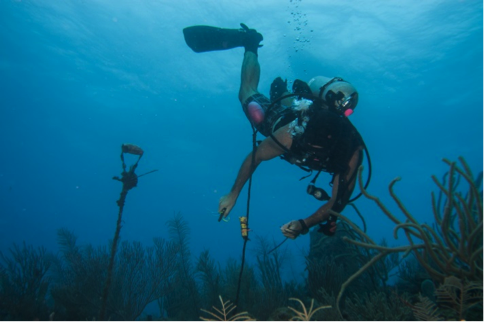 Today's guest blogger is Zach Foltz, the Caribbean Coral Reef Ecosystems Station Manager. Zach keeps the island running, keeps the scientists sane and keeps Randi coming back year after year. 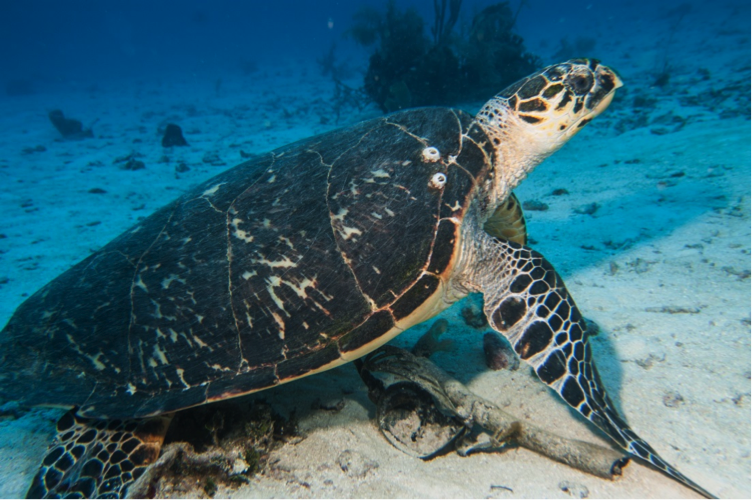 In addition, he is an integral part of the Smithsonian–New England Aquarium collaboration to monitor 24 transects to evaluate the state of the Southwater Caye Marine Reserve (SWCMR), and he measures fishes. Here's a glimpse into his world this week! As the Station Manager for the CCRE Program, I get the opportunity to work with a lot of wonderful researchers on a variety of projects in the many different ecosystems that are found near Carrie Bow Cay (mangroves, sea grass, coral reef and open ocean). While I have the opportunity to work with many animals, the monitoring project is one of my favorites because it is the only one that I am regularly involved with that lets me focus on my primary interest: fish. I have been working on the monitoring project with the rest of the group since its implementation almost four years ago. My role has been to identify and count fish species along our 24 transects on the reef. My partner Pete and I have been recording what fish species are found in the various habitats on the reef and how communities have changed with the establishment of the reserve. Changes are definitely taking place! 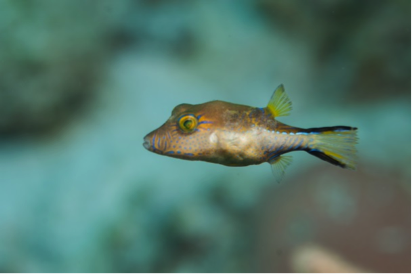 We have documented the explosion of the invasive lionfish, and a boom and bust population of sharpnose pufferfish. Pete and I also do a lot of the transect maintenance at each site. This involves securing a submerged float along with tags along the 30m transect so we can sample the exact same spot every time we go back. It is the last day of our trip and I am up bright and early to squeeze in one more dive before our mandatory 24-hour, preflight surface interval. Scott, Clare and I have to go to one of our sites to replace a float and collect more of Clare’s samples. No matter how much we accomplish and how much work we get done on days where we dive 4 times per day, it seems there is always just a little more work to do. It comes as no surprise that after having a week of wonderful weather and ideal conditions, the seas look angry and the wind is howling when we have to squeeze in this early morning dive. In a half-awake state, the three of us struggle to get all of our gear into the boat to head out to our site. After a short, bumpy ride, we reach the site, check our gear, and make sure that we have not left anything topside and roll backwards off the rocking boat. Once we get in the water, we drop down to the bottom where we find our transect and the float that needs to be replaced. Clare quickly gets to work sampling her corals and Scott works to retag our transect. As soon as I finish securing the float, I look up to check on the rest of the group and see a curious hawksbill turtle checking in on us. I follow him for a while as he poses for the camera until I see him eyeing something on the bottom. He swims right down to it and takes a bite. He quickly realizes it is not his flavor, spits the object out and rapidly swims away. I swim down to see what he was so offended by and it is a mask and snorkel! I pick it up so no other curious turtles make the same mistake and once we all get back to the surface and into the boat, I share the story. Turns out that the mask belonged to Clare who had dropped it from the boat on a previous trip to the island! What are the odds of that!? We bounce our way back to the island and I think about how lucky I am to go on a dive and see so much that goes on below the seas surface all before breakfast. The feeling quickly goes away when I remember that we have to unload the boat, pack all of our gear, and clean up the island all before the boat comes to take us back to the real world… So much to do in so little time.